HMRC VAT letter – what does it mean? Many business have received an HMRC VAT letter in the last week. 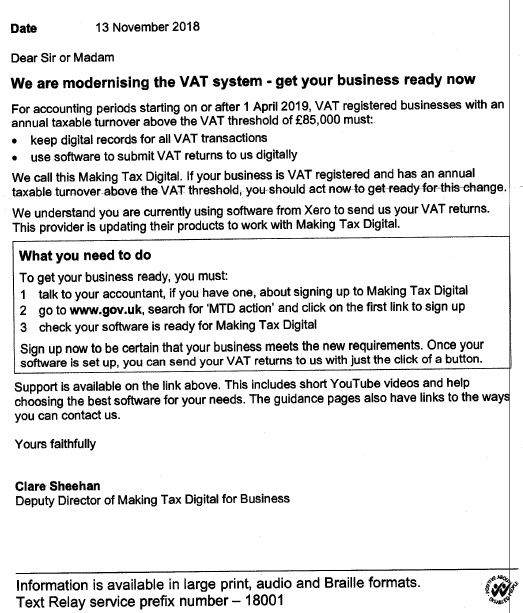 This letter informs VAT registered businesses that HMRC processes are being modernised, known as Making Tax Digital (MTD) for VAT. The HMRC VAT letter doesn’t require you to do anything yet. From April 2019 businesses registered for VAT with a taxable turnover above the VAT registration threshold of £85,000 will need to keep VAT records digitally. They will also need to file their VAT returns using MTD compatible software. This will start from their first VAT period starting on or after 1 April 2019. Most accountants have been preparing for MTD well before the HMRC VAT letter was issued. The good news is that if you are using digital accounting software such as Xero, you are probably already on track to submit your VAT returns under the new regime. If you currently keep paper records or submit your own VAT return by typing the 7 numbers into the HMRC website you will have to change everything about your bookkeeping and accounting process. The HMRC website you currently use will no longer be available once MTD is compulsory and you will have to submit your returns from compatible software. There is still time to transition to new software for April 2019, but if you are starting from a position of spreadsheets or paper records you can expect it to be a long and difficult process if you attempt it on your own. If you are in this situation, there is no time to lose! Make sure you have a plan in place before the end of December 2018. This will give you time to bring your records up to date for your final VAT return before MTD. Will Making Tax Digital take more admin time? If you have a good accountant, the MTD process won’t take you much extra time. Your accountant will be able to deal with all the extra work required to comply with MTD. Hopefully you are already in a good habit of keeping digital records using Xero and ReceiptBank. You can opt to take part in a public beta (trial version) of MTD, but it is important that you speak to your accountant before opting in. This ensures that you can to make the necessary preparations. If you don’t have an accountant and you currently prepare your own VAT returns, the new process is likely to take considerably more time than you allow at the moment. According to a report from the House of Lords for those transitioning from paper records, costs may be as as high as £2,600 and three days of client time to make the transition to MTD. What should I do now that I have my HMRC VAT letter? For businesses preparing your own VAT returns, consider engaging an accountant. If you don’t currently use accounting software, you will need to make sure you have a compatible (online) package in place by April 2019. Where you do currently use software, check that your provider is ready for MTD. Tidy up all your financial records to ensure that any historic errors are not being carried over to MTD. What if I am already a client of Alterledger? We are prepared for Making Tax Digital and all our VAT registered clients will be migrated onto a new VAT platform by April 2019. The sign up process is straightforward from your end and should involve little more than clicking on verification links in emails from HMRC. If you would like to take part in the public beta of MTD, please contact Alterledger. We will advise whether you are suitable for the trial.